Closing your doors for even one day to make renovations to the hardwood surfaces in your business can mean a loss of thousands of dollars. That is why businesses across North America have chosen N-Hance Wood Renewal. If your floors, cabinets, furniture or trim need to be refinished, N-Hance is the perfect solution for your business. 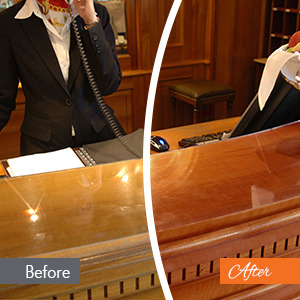 Worn and damaged hardwood surfaces can change the whole look of your business and your customers’ perception. Give your business a fresh new look without shutting your doors for days or emptying your bank account. N-Hance comes in consistently under the price of replacing or refacing. Often 1/3 to 1/5 the cost. Saving your business time and money. Using our Lightspeed technology, most areas can be completed in just one day. So close the doors at the end of the business day and let N-Hance in to change the look of your business over night. Know that when you use our Lightspeed Plus™ finish, your wood surfaces will be cured with a ultra-violet light, and you can immediately put your office furniture and/or merchandise back in place when our technicians are done. Does your business have locations throughout the United States and/or Canada? We have you covered. You can have the same consistent results throughout each of your locations with the ease of having one booking contact verses multiple service providers. Where to Buy N-Hance Revolutionary Wood Renewal.